Burnley caretaker boss Steve Davis will find out this week whether he has a chance of getting the job permanently. Clarets stalwart Davis, 39, took charge for Saturday's 1-0 win at Leicester after former manager Steve Cotterill's shock departure on Thursday. "It was a good start," Davis told BBC Sport. "I'll speak to the chairman this week and we will talk about the job. "It was a proud moment for me to manage the club that I love and we will see what happens next." 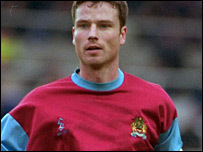 Davis played 322 games for the Clarets in two spells at Turf Moor. Since ending his playing career he has been back at the club as a scout, then first-team coach and reserve-team manager under Cotterill. He was only promoted to assistant manager on 3 November when he replaced Dave Kevan. Davis admits that Cotterill's exit was unexpected but he was pleased with the reaction of the players. "It has been a difficult week," Davis added. "Steve leaving came as a surprise to everyone and he will be missed, there is no doubt about that - after the game everyone in the dressing room said the win was for him. "But I just wanted to enjoy the day and I have certainly done that."